Is Revenge of the Sith your favourite Star Wars movie? Do you get like sad,excited,hyper,cry,or "eeeep!!" when you see ANYTHING that has to do with Starwars Revenge of the Sith?? Have to share. About ROTS plot devices ("tropes") - or what George learned in film school.... From the site: "Tropes are devices and conventions that a writer can reasonably rely on as being present in the audience members' minds and expectations." pass it on star wars fans! 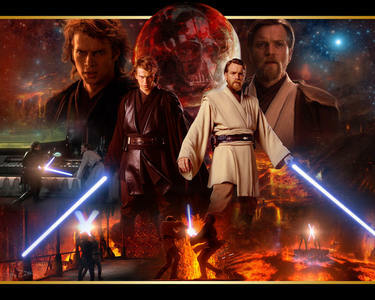 a comment was made to the poll: Is Revenge of the Sith your favourite Star Wars movie? a comment was made to the poll: Which dialogue (just before the final battle) do you prefer ? a comment was made to the poll: Do you feel sympathy for Vader? a comment was made to the poll: Were you upset when Padme died? What does Obi wan say before he defeats Anakin on Mustafar? "It's over Anakin, I have the higher ground." "I'm stronger, you can't defeat me."